When creating a mobile marketing strategy, you can do more than just hope for results from your mobile ads - you can create an effective brand presence that takes advantage of all the ways consumers use mobile technology. 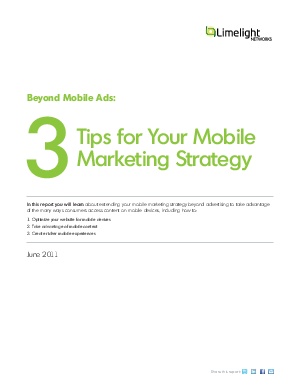 Download Beyond Mobile Ads: 3 Tips for Your Mobile Marketing Strategy to learn how marketers are building closer ties with on-the-go consumers as they surf, search, share, and consume entertainment on their mobile devices. Advertising alone is not a complete mobile strategy. Learn how to use every mobile opportunity to your advantage.